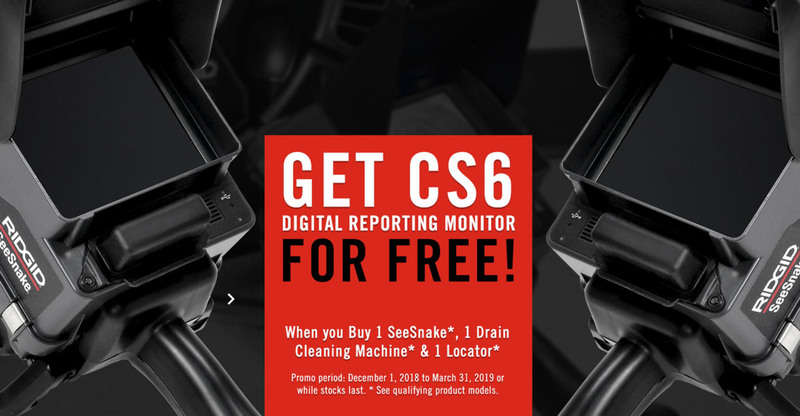 TAKE ADVANTAGE OF THIS RIDGID CS6 PROMOTION! 1. Customer should buy directly to our distributors and distributors’ dealers. 2. Customer needs to fill-out the online redemption form. The customer needs to attach the receipt or invoice as proof of purchase. if they bought the item) and dealer (if customer bought the item). 4. Once verified, RIDGID will contact customer for confirmation. paid by RIDGID). Alternatively, we will send the FREE item to the area manager in your country and he will be the one to deliver the FREE product to you at the same time can do the product demonstration. 6. RIDGID calls the customer to check if the item was delivered. 7. End User promotion only. Distributors and dealers are not qualified on this promotion. 8. Promotion is only applicable in Japan, Singapore, Philippines, Thailand, Malaysia, South Korea, India and Indonesia. Unit must be purchased from the same country where the free product is being shipped. 9. Unit must be purchased from the same country where the free product is being shipped. 10. Shipment of FREE product starts after being verified and customer got confirmation. Allow 4-6 weeks for delivery. 11. Limited promotion until FREE product last. On first to register and verified, first served basis. 12. Invoice/receipt must be dated between December 1, 2018 through March 31, 2019. 13. No substitutes allowed. Cannot be combined with any other RIDGID promotion.